Individual Awards: Scored his first goal for the Wanderers in Round 27 of Season 2017/18 against Adelaide United. Description: An experienced midfielder Marcelo Carrusca helped Adelaide United win the FFA Cup in 2014 along with the A-League double in 2015/16. 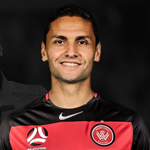 Having spent 5 years in Australia, he became an Australian citizen in 2017 and will not occupy a foreign player spot in the A-League. In 12 games he performed better as an attacking midfielder than the other members of the squad, setting up assists and finally getting his first goal in the last game of the season. Nice to have a recognised #10 in the squad. Not sure why he has sat on the bench for Melb City and only played off the bench a few times...but hopefully he will be really hungry to get back on the pitch, and hasn't lost too much of the skills he's shown in the past. He will know what Josep ultimately wants out of his team, and he's bought into that in the past. I'll be excited to see him playing in red and black!! Unless he's deteriorated a great deal as a player - that could be the understatement of the year!